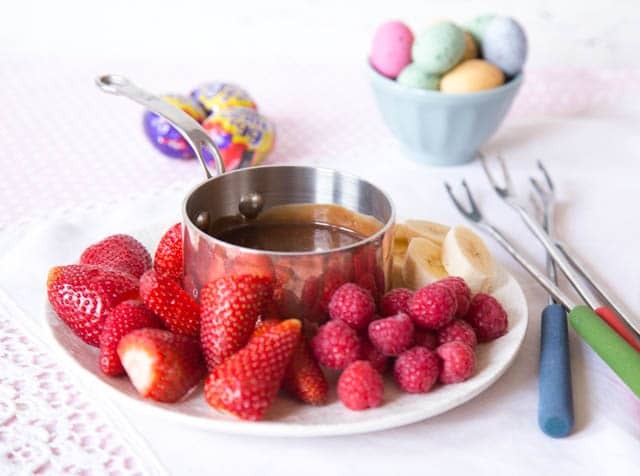 Enjoy this Easter treat of a chocolate fondue made with fondant filled Creme Eggs. An easy and delicious Cadbury Creme Egg recipe! 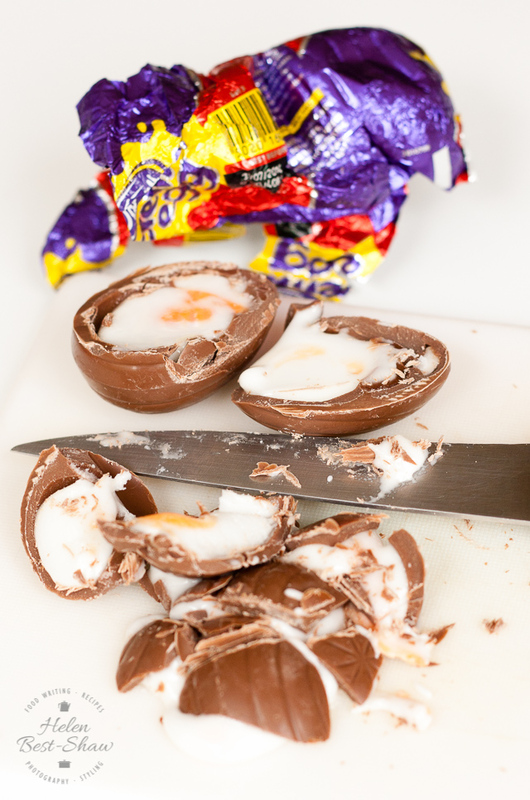 This Creme Egg recipe is a great way to enjoy these naughty treats. I do like these sticky, fondant filled chocolates but a whole one can be a bit too much. But here’s a Creme Egg recipe that lets me have just as much or as little as I like, and by dipping fruit into the gooey fondue, I can bluff myself into thinking that it’s a healthy choice. It’s also a great excuse to get the fondue set out of the cupboard! How is Creme Egg Easter Fondue made? First, chop up the Creme Eggs, but be warned; it’s almost impossible to do this neatly and without getting the fondant filling all over the knife and chopping board, but scrape it all into the saucepan. Second Add chocolate and double cream to the Creme Eggs. Third Gently melt the mixture, and start dipping! Any fruit that’s solid enough not to fall off the fondue fork is suitable. But vary the texture: crispy apple pieces or sharp pineapple, for example, as well as strawberries, raspberries or a cube of melon. Of course, part of the fun of fondues is thinking up the forfeits for when you lose the fruit from your fork! If you try this Creme Egg Easter Fondue – An Easy Creme Egg Recipe please tag #FussFreeFlavours on Instagram or Twitter. It is amazing for me when for me when you make one of my recipes and I really do love to see them. You can also share it on my Facebook page. Please pin this recipe to Pinterest too! Thanks for reading Fuss Free Flavours! 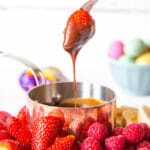 Enjoy this Easter treat of a chocolate fondue made with fondant filled Creme Eggs. pieces mixed fruit – cut into bite sized – strawberries raspberries, grapes & bananas. 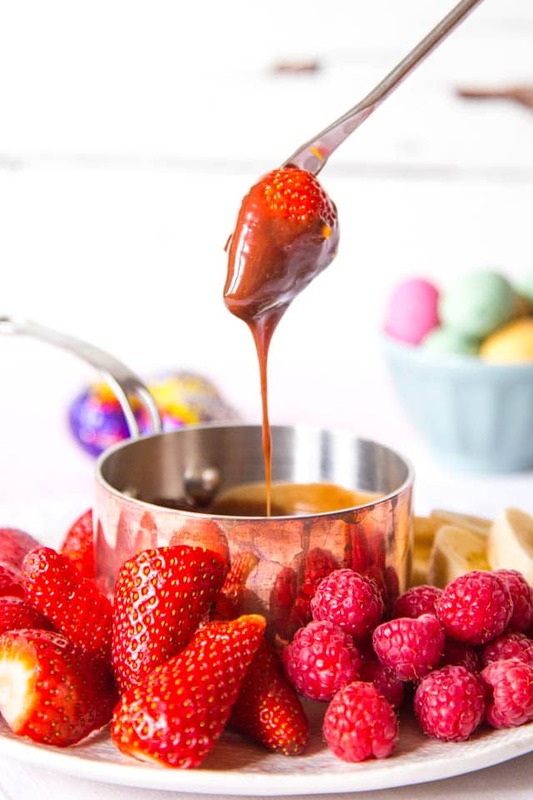 Place the cream, chocolate and Creme Eggs and liqueur if used into a small saucepan and gently heat stirring all the time until the chocolate has melted and you have a rich chocolate sauce. Transfer to a fondue pan or bowl and serve with fresh fruit to dip into the fondue. Leftovers from this creme egg fondue are ideal for reheating and pouring over ice cream. You don't actually need a fondue set for this! serve in a mini saucepan or bowl.